In September 1914 a quarter of a million Belgian refugees poured in through Britain’s ports having escaped the advancing German Army. This was, and still is, the largest refugee movement in British History and is largely forgotten. The British Government accepted the responsibility for the reception, maintenance and registration of these refugees, whilst at the same time they sought out assistance in housing the refugees with local authorities. The Belgian refugees remained in Britain until after the end of the war when most returned to Belgium. 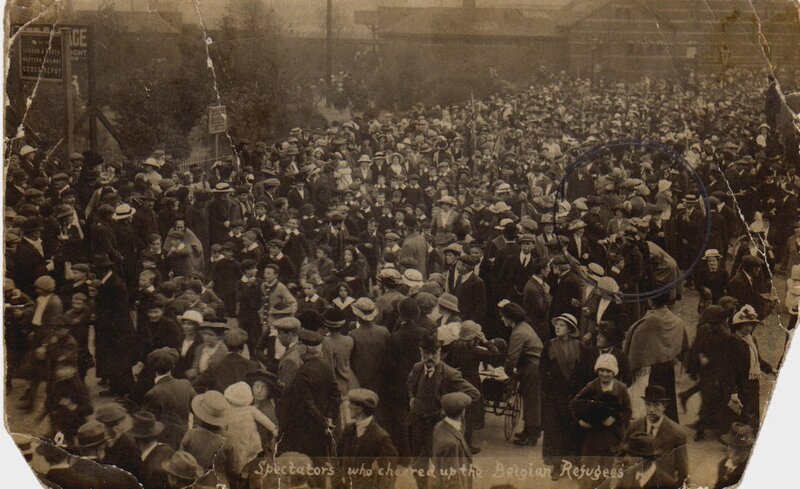 We doubt whether, in the history of Rhyl, such a huge demonstration depicting sincerity and enthusiasm has been witnessed in Rhyl to excel that which took place on Tuesday afternoon, on the occasion of the arrival of the Belgian refugees. For days the event had been patiently awaited, and the house on the East Parade set up as a home for the homeless, was literally besieged with enquirers anxious to learn when the party were expected, and the great interest culminated in a memorable scene outside the Railway Station on Tuesday. At least 200 people assembled, not to mention the many thousands that lined the route all along the High Street. All the elementary schoolchildren were present, carrying banners and flags. They had commenced school that afternoon at one o’clock in order to be at the station at 3pm, and surely no better means could have been devised for impressing upon the youthful minds the immense trials the poor Belgians have undergone. The party were timed to arrive by the 2.55pm train from Liverpool, but it did not arrive until 3.20pm. Councillors, officials and priests were amongst those who welcomed the refugees. As they left the station, the awaiting charabanc was kindly placed at their disposal by Mr Anderson, the Manager of Rhyl and Potteries Motors Ltd. There were 22 in the party altogether, consisting of several old men and women, young married women and a number of children, natives of Aerschot. The vehicle in which they took their seats were decorated with several Belgian flags, and on the glass in front of the driver were the words “Welcome Home”. Deafening cheers rent the air immediately the visitors were observed, and the Chairman of the council had scarcely any need to call for three cheers, in acknowledging which the old men waved their caps. Bags of sweets, tied in red, whit and blue ribbon were distributed to the Belgian children, who were already carrying dolls, picture papers etc. At the top of the High Street, the newly formed North Wales “Pals” Brigade, who, under Colonel Dunn are training in Rhyl, had lined at attention. The party were assembled on the steps of 2, East Parade for a photograph. Councillor F. Phillips (Chairman) speaking with evident emotion, said he was proud of Rhyl, and he would remember that day as long as he lived. His heart was too full to deliver a speech, but he called for 3 cheers for the poor Belgians. 3o more refugees arrived last (Thursday) evening. Great coverage of an obviously big occasion to show the towns solidarity. Hi…………..Take a look at the work we have been doing about the Belgian exile/refugee colony at Elisabethville, Birtley near Gateshead. …………and by the way did you know the St.Asaph born Ruth Ellis, the last woman executed in Britain was the daughter of a Belgian WW1 refugee? ………… and what about that other child of Denbigh – Henry Morton Stanley – and his time in the Belgian Congo? Thanks for your comments Bill, very interesting. Hi …………….Thanks for joining in our Birtley Belgian stories. Mind you mustn’t take this the wrong way. Memories of Rhyl………in the 1950’s my grandparents lived in Llandudno. Eldest of a family of 8 I was about 10 when I realised not everyone had a Nanny at the seaside as we lived in Worcestershire. We never got off the train in Rhyl, nor off the Sunday excursion coach – we had to go on to the “posher” Llandudno – yet for us kids the fairgrounds at Rhyl looked so much more exciting than a day on the Great Orme! Hi…This is very interesting for me, beeing Belgian and looking forward to moving to North Wales to open up a shop with Belgian goodies and Beers. We had absolutely no idea that there wher Belgian refugees in North Wales and that they where that apreciated! We even found a Belgian Promenade at Menai Bridge! We are visiting Gwynedd fromt he 1st to the 5th of Februari to look at houses and shop locations and we will sure make time to visit our history in North Wales. Thank you for sharing, we would not have known this as it isn’t mentioned anywhere! We come back to you, It is Thanks to the Rhyl History Club that we began looking further than just relocating for health and starting a specialised business, we now want to renew the historic link between Belgium and Wales and use it to show the best of North Wales to Belgium and vice versa. We liked and follow your facebook page and we have selected Bangor as the first City/Town in which we will start our Belgian shop with Beer/Chocolates & more to open end of August or beginning September 2015, with a Beer tasting club that delivers at home all over North Wales. This location is mainly due to the University and central location. In addition we are going to see if an annual Belgo-Welsh Festival can take place on the Belgian Promenade in Menai Bridge in May 2016 (Wales and local counsils are very open and positive about the idea) and a twin festival somewhere between Mechelen & Aarschot in the month of October or November 2016. We are also looking for a Town in North Wales to hold the annual 21 of July Belgian national Holiday event. We are between Llandudno and Rhyl and will get more into that once we have settled and opened up shop. We will be visiting from 12 to 20 of May 2015 one last time before moving and hope to meet up with you on this occassion or in the end of July, when we finally move to North Wales. We will bring some Rosé de Gambrinus from the Cantillon Brewery if you are available for a chat in May! Many apologies for the delay in replying, your plans sound very exciting! We look forward to hearing more about them in May or July. I will take your message to show the members of our committee at our May meeting. You can also contact us via our e-mail: rhylhistoryclub@gmail.com We look forward to hearing from you again, kind regards Rhyl History Club.